Neck massagers or shiatsu pillow massagers, as they are sometimes known, enable you to get deep-tissue neck massage, often times with heat, in a portable package. Some like the Zyllion strap to a chair while the LiBa shiatsu neck and back massager has hand harnesses for you to hold and direct the massager as it deeply probes your neck and upper back areas. The LiBa is an interesting choice- it has received tons of positive feedback from a satisfied user base. They like that they are able to control the massage pressure, that it is easy to maneuver from your mid back up to your shoulders and neck, that it doesn't take any batteries and that it is affordably priced. Some users wish that the heat was a little bit stronger and that it wasn't so loud. Some office workers say that it isn't suitable for an open work office environment because the noise is distracting to coworkers. 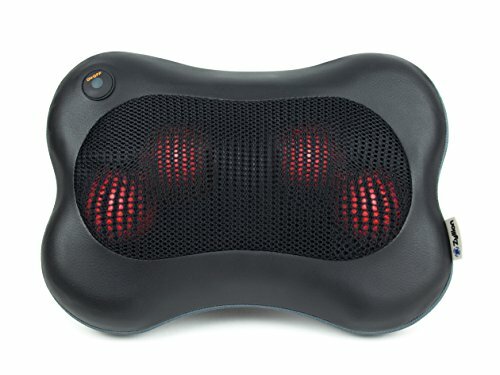 This 3.1 pound, Black Shiatsu Back Massager & Massage Pillow with heat is a great multi-purpose massager that has four massage nodes with deep massage capabilities. User love that it is comparable to many of the higher priced products of the same type at a much lower cost and love how well it works to loosen their muscles, but it can be a little on the loud side. The Heat Massager can be used without the heat option if you are just looking for the relief without the heat on your body. It also has a multi-use function, so you can use it for your neck, back and calves but users mainly seem to like it for their neck and back. The Shiatsu has a bi-directional movement to help mimic getting a massage from an actual person. One customer mentioned that it worked really well for their smaller body frame and the smaller knobs were able to get into tighter crevices. They went on to say it really helped underneath their shoulder blades. The users that had a problem with the massager all seemed to gravitate to the fact that it was too loud for them or that there was a problem with the product when they first got it. One customer didn’t feel that the product met their expectations, they said it was too bulky and the motor was very loud. Some users also seem to think the heat function is not strong enough while others say it is just the perfect addition to their massage. This neck, back, and foot massager is a great money-saving alternative if you are looking for a muscle massage on a budget. This 3.8 pound, Naipo Neck and Back Massage Pillow is a great deep-kneading heated massage pillow that will change the direction of the massage automatically after every minute. Its users rave about how well this product feels, especially when it changes direction but you should make sure not to apply too much pressure while using the massager. The Naipo Massage Pillow comes with a regular charger and also a car charger. With the car adapter when going on a long trip it can be used without worry of the battery dying. One reviewer who purchased the product mentioned that it is big enough to cover a good portion of their back, but at the same time small enough to hit all the right spots. They went on to say that they liked being able to use the Naipo on the way to work. They go on to say that it is great with the addition of heat and also that the strap holds it nicely in place on a chair so that it doesn’t slip around. Not many users had negative things to say about this Neck and Back Massage Pillow but they did mention not to place all of your weight into the product. Another mentions that since it is small it won’t cover a large area of your body. The same reviewer then suggests having a pillowcase on it to help keep dust out. This neck and back massager is an excellent option for those who travel a lot or just need to a good muscle massage after a long day. This 4 lb., Deep Relax Massage pillow is a great upper and lower back heated massage pillow that is equipped with an overheat protection device that will automatically shut off after 20 minutes for safety purposes. Users love how well the heating feature is and especially the automatic shut off feature. Some found the massage balls inside to be a little bit too hard for them. The Deep Relax Massage Pillow has a light and slim design and an incorporated heating function that can be toggled on and off. One reviewer specifically gives a pros and cons mentioning that the build and quality is comparable to brands that cost much more. They liked that it comes with both a wall and car charger, and that the massage cushion is quiet. They did not like that the velcro strap was not long enough to wrap around the car seat. This user goes on to say it might fit an average sized car but was not able to work with their sedan, though they still use it in the car without the strap. They are not the only ones that mentioned that the car strap wouldn’t make it around their car seat. 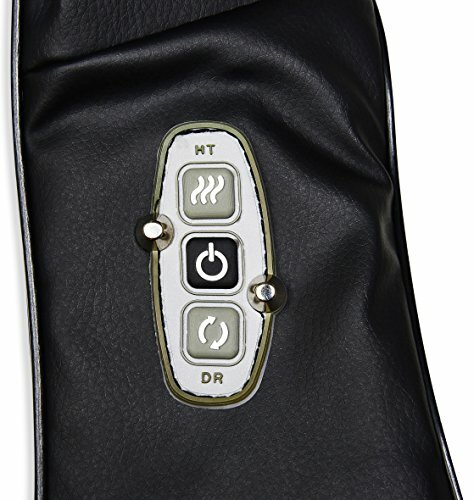 This upper and lower back massager is an exceptional option for those looking for a quiet running heated massage. This 3.5 pound, Zyllion ZMA-13-BK FDA Listed Shiatsu Pillow Massager is an exceptional multi-use body massager that is 6cm wide. It is perfect to use on upper & lower back, neck, abdomen, calves, and thigh areas. The users love how sturdy the Zyllion is and how you can use it for long periods of time, but they warn that you be careful with the amount of heat that is applied on your skin. Zyllion wanted to showcase the quality of their products and went as far as getting FDA approval. The Shiatsu massage pillow has an ergonomic design that makes it fit many parts of your body. One customer that bought the item brought up that it was great but they had to deal with too many problems to justify keeping it. They went on to say that it started off relaxing but took too long to heat up and then it got too hot. At one point they said that it even got a burn on their neck. Most reviewers loved this product including one that added to their review after reading what some others were saying. They mentioned that it did reach every part of your neck and really helps with getting out spasms. They also said that it is not too bulky, but considering the power that the Zyllion gives off it is surprisingly sleek. 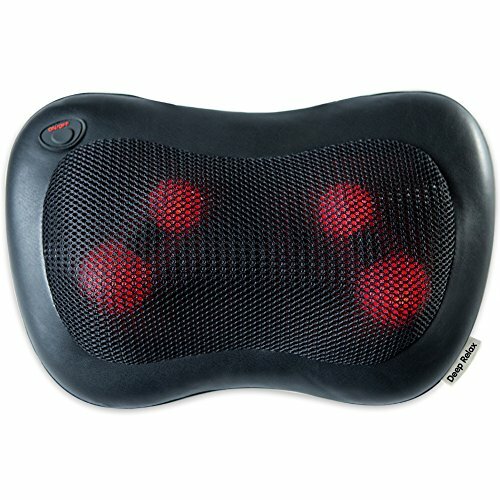 This ergonomic heated massage pillow is perfect if you are looking for something that you can use on multiple parts of your body. 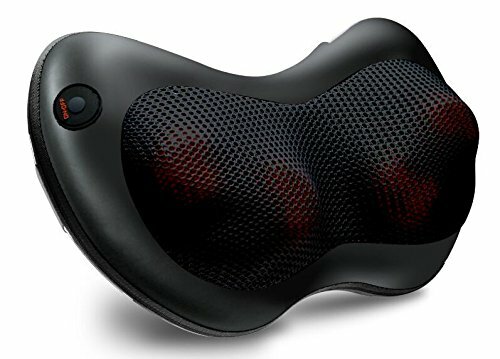 This 3 lb., HoMedics NMS-375 Shiatsu is an adequate heated neck and shoulder massager, it has flex handles that allow you to customize the intensity of each massage. Users love that they are in control of the amount of pressure they apply, but it is a little on the bulky side. The HoMedics Shiatsu gives you three massage option being: shiatsu, vibration or combined, and soothing heat for a more relaxing massage. Its controls let you use massage or massage and heat depending on what you are looking for. Some of the reviewers for this product seem to have a problem with it not reaching their shoulder and feel that it is only good to use on the neck. One reviewer said that you can get it to work on your shoulders but to do so you would have to move it over and work one side at a time. They also suggested that you could try to flip it upside down to reach different areas. 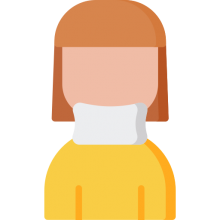 While another customer mentioned that for something that is advertised for neck and shoulder it does nothing for their shoulders, but it is great for their neck. This shiatsu neck and shoulder massager is a mid-priced item for those that want to have more control over their neck and shoulder massages. If you're looking to purchase a shiatsu back massager, make sure that you also search for items like kneading massage pillow, shiatsu massager, or heated neck and shoulder massagers- these massaging devices go by many names. In general, one of these shiatsu massagers will feature different massage nodes that are designed to relieve and relax muscle tightness and soreness in your neck and back. They also include heating functionality that additionally helps to work on sore and aching muscles. 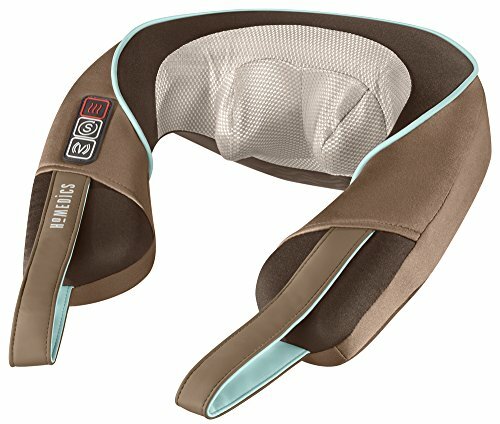 Interestingly, some like the HoMedics neck and shoulder massager will have different massage options that include vibration, shiatsu or combined- with heat as another option to layer on top of those three different massage options. Some of the neck massagers will work with batteries, while others have to be plugged in- some are even designed for use in automobiles, strapped to the head rest of the driver or passenger seat. Indeed, these are interesting pain-relieving devices that can substitute for expensive spa visits or chiropractic adjustments, in some cases. Some of the primary benefits that the manufacturers claim these massage devices provide include the relief of shoulder pain, increases in blood circulation, decrease in fatigue associated with stress, decreases in muscle tension, as well as an overall increase in positive mood. Be sure to check out our comparison table at the top of the page to get a sense of what's available on the market before you make your decision- it's likely that you will be pleasantly surprised with your purchase as these devices are pretty cheap and have the potential to increase your comfort levels.